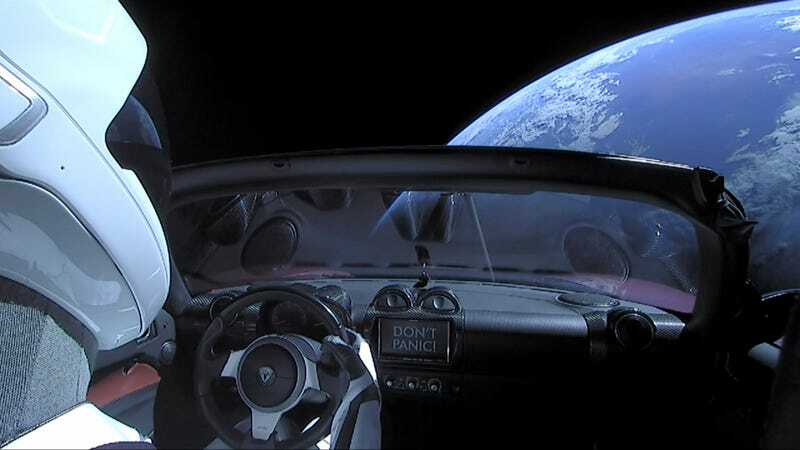 By now it’s old news—somewhere in space, there’s a red Tesla Roadster with a spacesuit-wearing dummy in the passenger’s seat. It probably doesn’t drive anymore, and NASA has officially listed it as a celestial object. But now that it’s out there, the next question is, well, will it crash into anything? A team of researchers at the University of Toronto is trying to answer that question. The answer, obviously, is that we don’t know. “We estimate the probability of a collision with Earth and Venus over the next one million years to be six percent and 2.5 percent respectively,” the authors write in the paper published today on the arXiv physics preprint server. The car is now in an elliptical orbit that will take it further than Mars, 160 million miles from the sun, according to The Verge. Study author Hanno Rein told CBSNews that seeing the object’s data on the JPL database got them excited. They ran a number of models with different initial conditions—it’s hard to model something so many years out because of how many other gravitational factors there are. Instead, they have to do things statistically and get results as percentages. The car’s next close encounter with Earth will be in 2091. To be clear, this means that it’s very, very unlikely the car will hit the Earth. But obviously a human-induced nonzero percentage of any collision is a little unsettling, even over time periods longer than it will take to nuke ourselves. As it is a paper on the arXiv, it’s worth taking this paper with a grain of salt since it hasn’t been peer reviewed—we’ve also reached out to a few other astronomers and are waiting on a response. SpaceX did not immediately respond to a request for comment. I mean, wouldn’t it be the ultimate irony if some day in the distant future an ancient Tesla from space strikes a Tesla factory?